Maurice's Piggy Park in Irmo, SC. Food is an essential part of any road trip. Not only does it provide fuel for your travel adventures, but it also offers a little insight into the local culture. Let’s face it, you just can’t pass up fresh lobster while you’re in Maine, or Crab Cakes when you visit Chesapeake Bay; and no trip to New Orleans would be complete without café au lait and beignets at Café Du Monde. And then there’s South Carolina, which has it’s own collection of culinary treats. 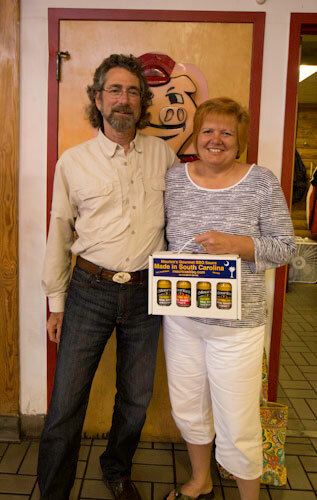 I was already familiar with the tasty Low Country Boil and even She Crab Soup; but thanks to my local friend Gene Retske, I recently received a mouth watering introduction to South Carolina mustard-based barbeque. According to Gene, it’s a regional favorite that’s only available near Columbia. And since I was in the area, I decided to give it a try at Maurice’s Piggy Park in Irmo. Gene Retske introduced me to Piggy Park, and gave me a few pointers on how to correctly eat SC BBQ! 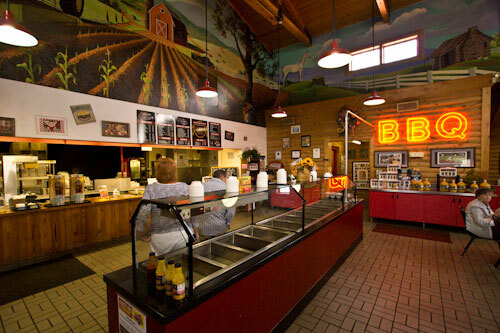 Located just a short hop off of Interstate 26, the exterior of this stand-alone BBQ joint is very unassuming, but once you cross the threshold you’re transported into the full South Carolina barbeque experience. And I’m happy to report that access is good at Maurice’s Piggy Park too; with accessible parking near the door, a level entry, plenty of room to navigate a wheelchair inside, and roomy accessible restrooms. Since I was a neewbie at the whole South Carolina barbeque experience, I turned to Gene for a little help when it came time to place my order. He quickly informed me that if we were here on a weekend, the gut-busting buffet would be the best choice, but since we weren’t, he suggested the Big Joe of the Little Joe BBQ Pork Sandwich. 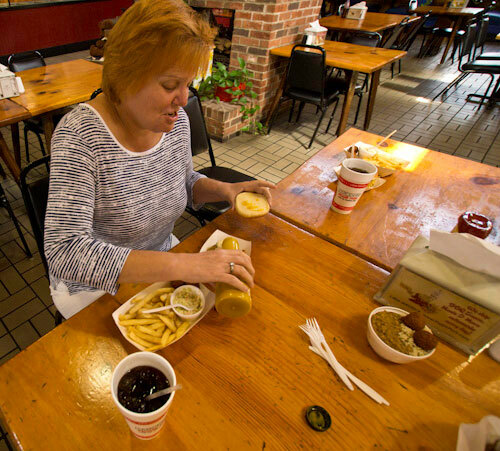 And of course I had to have the basket – with French Fries, Hush Puppies and Cole Slaw – for the full experience. 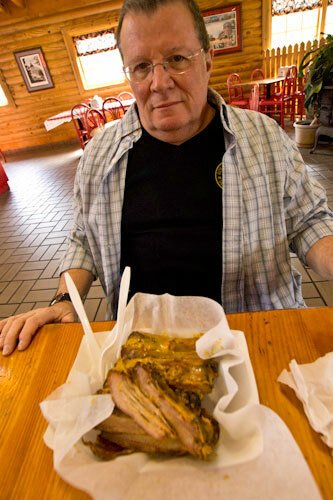 Gene also ordered a pound of BBQ Ribs and some Hash and Rice, just so we wouldn’t go away hungry. Now of course my first instinct was to sit down and tear into my sandwich, but as Gene pointed out, that’s just not the way you do it in South Carolina. First you take off the top bun and you slather on some Cole Slaw – and slather is the correct verb, as you want to make sure you get a good dollop of it on there. Then you pour on the Barbeque Sauce -- there's no such ting as too much! Next you pour on some more barbeque sauce – don’t worry, there’s no such thing as too much. Then, and only then, can you replace the top bun, gather a good supply of napkins, dig in, and wait for your taste buds to do a happy dance. I have to admit that I was a little skeptical about the Cole Slaw on the sandwich, but in the end I totally enjoyed the flavor combination. The vinegar in the slaw is the perfect accompaniment to the mild mustard flavor in the sauce. And when I was done, I had a pile of dirty napkins in front of me, sticky hands and yellow tinged fingernails. But it was a good kind of messy! And if you’d like to take a little taste South Carolina home with you, rest assured Maurice’s has a wide variety of sauces to choose from. And if like me, you just can’t decide, then just grab a variety pack! And of course we took home a variety pack, so we can try it at home! So next time you’re in the Columbia area, stop in at Maurice’s. You won’t go away hungry; and you won’t be embarrassed, because you now know how to eat South Carolina barbeque the proper way! 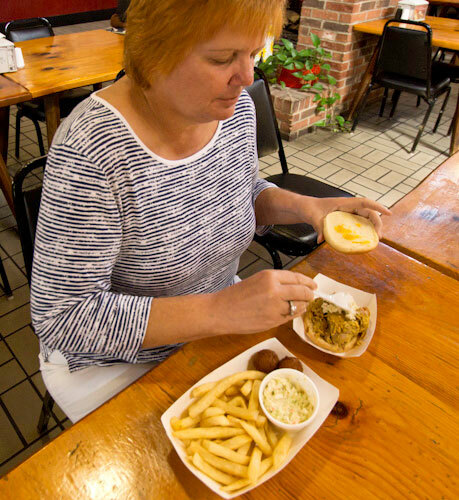 This entry was posted in Food and tagged accessible travel, Barbeque, comfort food, disabled travel, mustard, Piggy Park, South Carolina, Wheelchair Accessible by Candy B. Harrington. Bookmark the permalink.